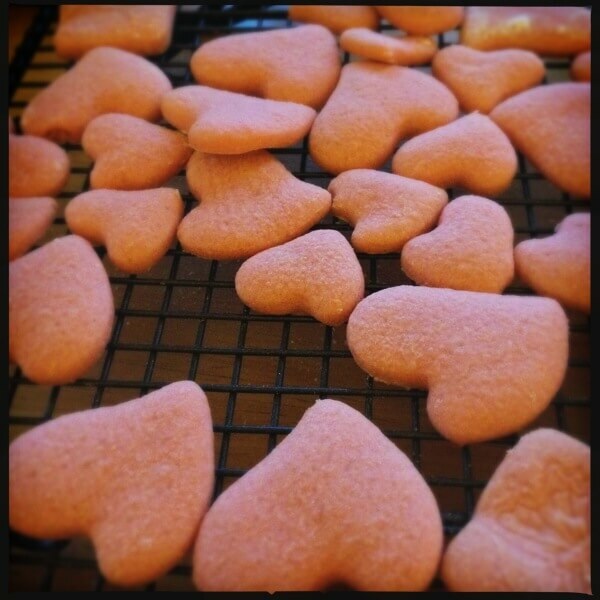 This is a great recipe for light, crisp cookies that I baked this week for St Valentine’s. The cookies without any decoration will keep for up to 7 days, if you don’t eat them all, in a dry sealed box in your cupboard. Add the baking powder to to the flour as you’re sifting. Add 1 egg and beat until it is well incorporated. The mixture should return to being light and fluffy. Add the second egg and beat again. If the mixture becomes curdled add a tablespoon of your sieved flour to fix the batter. Stir in the food colouring. If you don’t have food colouring then that’s okay because the taste doesn’t depend on the colouring. I just used it to make pink cookies! Add half the flour, mix well and then add the second half and mix again until you have a sticky dough. Turn the dough out onto a sheet of clingfilm. Wrap well until it is sealed and place the dough into the fridge for at least 1 hour. At this point you can put the dough into the freezer to keep for up to a month. Just remember to take it out to defrost in the fridge until you are ready to cut it to size and bake. After at least an hour heat your oven to 160C (or 150C for fan ovens). Dust your worksurface and rolling pin with flour. Roll the dough to approximately 1cm thick. Cut as you please with whatever shape cutters you like. I used heart shaped and circular cutters this time around but really you could use whatever you wish. Place onto the lined baking tray and into the oven. The amount of time the cookies will take to cook depends on their size. A medium (palm of your hand) sized cookie takes approximately 12 mins. Adjust your cooking time up if they are bigger or thicker, down if they are thinner or smaller. Remove your cookies from the oven after they are cooked, leave to stand on the baking tray for 2 mins, then remove from the parchment and place them directly onto a wire rack to cool.